Incidental Incubator (2010) is a sculptural representation of the class system and its failure to plan for the future of humanity. 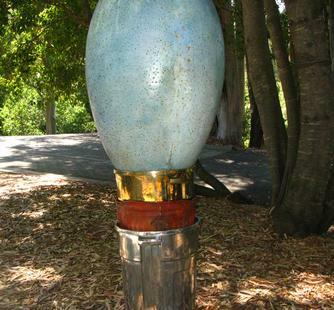 Three stacked trash bins of cast and polished bronze, polished aluminum, and rusted cast iron, representing the upper, middle, and lower classes, hold an oversized egg, approximating the size of all the reproductive material needed to recreate the earth's six billion inhabitants. The egg, which is approximately 8' high, appears to be both discarded and emerging from the trash bins. There is an elegant simplicity and hopefulness to this work that references Brancusi and his White Negress series.